Hi everyone, Julie Ann here from Magpieheaven, joining you this evening with a post about Faces. I've always loved drawing faces ever since I started doodling them over my rough book in the sixth form! Just lately I've started to sketch faces regularly, scanning them into my computer and printing them out for a variety of projects. 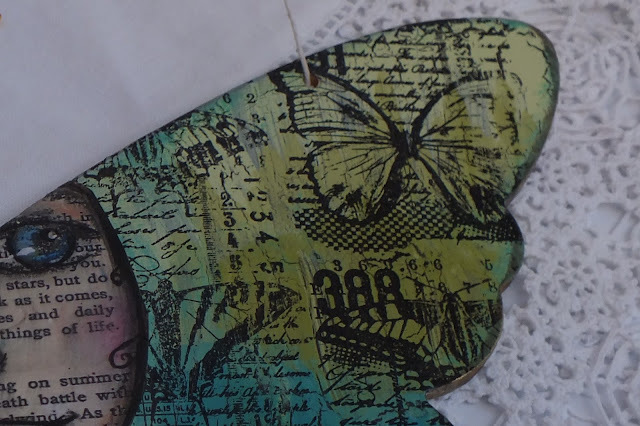 I love the opportunity to combine my own art work with the wonderful variety of PaperArtsy stamps and paints. 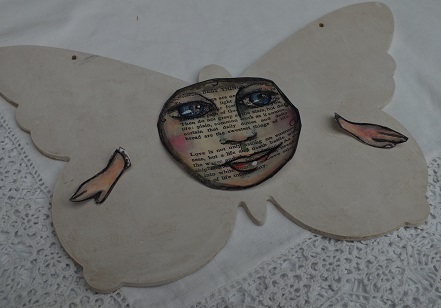 For tonight's project, I created a butterfly girl wall-hanging on an MDF shape to remind me to float above life's problems. Step One: I began by gessoing an MDF butterfly of roughly 7" x 3" so that I would have a smooth surface to work on. I selected a sketch I had done using Portfolio Pastels diluted with water over vintage book text and scanned this into the computer, printing it out on good quality presentation paper. Below you can see the original sketch and the printed out copy. Step Two: I decided that to create a real illusion of floating, I would add some hands, so I cut out both the face and hands and played around with the positioning of them until I was happy with the effect. I added more colour to the face with the Portfolios and highlighted the eyes and lips, adding glimmer and gloss with Fresco Snowflake. I added a couple of coats of Satin Glaze to really bring the colour to life and to protect and finish the face and hands. ...but I trusted the stamping with HP1506 would work its magic on my Butterfly Girl! Step Four: I love stamping over Crackle! For best effects, I re-ink my pad with jet black Archival so that the stamping is really strong and defined over the crackle. .... and then stamped the sentiment from HP1506 in Chalk and clear embossed. The frame around the edge is simply a cocktail stick dipped into Snowflake Fresco paint to create tiny dots around the message. Step Six: I used a sand-paper file to neaten off the edges at the top, highlighted the edges with classic Treasure Gold and - just for fun - gave my Butterfly Girl antennae from flower making centres! 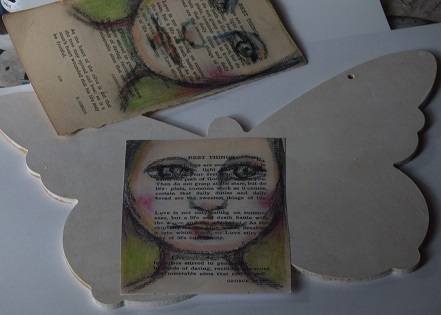 It really is fun using your own hand-drawn faces along with PaperArtsy stamps on substrates like wood or MDF. Why not create a wall hanging on another shape: a heart, for example, with your own hand-drawn face? You could make a background stamped over crackle; create a stamped border or decorate the face with stamped designs. I would love to see what you come up with. Every good wish for a wonderful creative week from Julie Ann at Magpieheaven (@woletz1 at Twitter). This is gorgeous Julie Ann, love it. Always very cool to see faces and text mixed together. 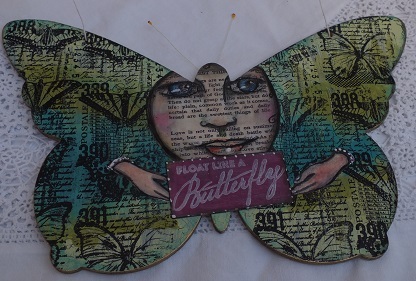 love the face, Julie Ann, and the butterfly itself looks fabulous! gorgeous colours too. Yep - I am inspired Julie-Ann. I think hubby needs to go cut me out of butterfly but alas - I can't draw faces!!! No excuse - I can find a face too!!! Hehhehehehehehe!!! Can you tell that I just love this?????? She is beautiful. So wish I could see her in person. Love the textured background and your face is just perfect too. j. 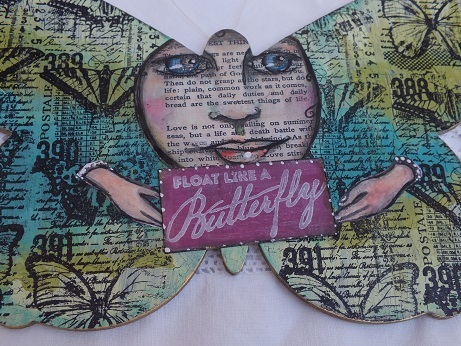 Beautiful idea and beautiful Butterfly Girl, Julie Ann! She almost has a Mona Lisa smile, lol! Love the background stamping too....just totally wonderful! I love this! The colors are wonderful. 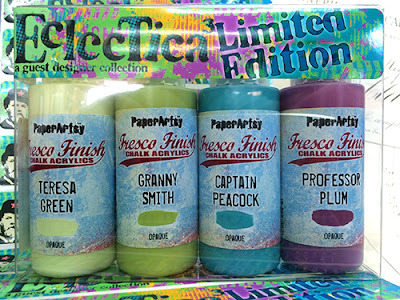 Is there a US company that sell your line of paints and stamps? What a delight! 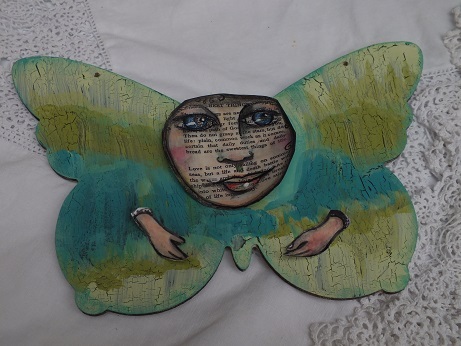 I love your blue green butterfly woman... another beautiful face, such a warm light in her eyes - and I always love the book text detailing. This is fabulous, Julie Ann!!!!!!!!!!!!! Whenever I view your art the first word that pops into my head is Magical, this time was no different. I love the idea of combining your beautiful art with PA stamps, they work an absolute treat. The idea behind the sentiment is a beautiful notion and something we should all aspire it. Another piece of beautiful and inspirational art. I just adore your butterfly lady- the way you have showcased those new stamps,which are absolutely beautiful!,well...fantastic! Well done!